Wonderful page! I love the photos of your Dad. Love this layout! Love how you created the 'flag' and all the stitching and distressing. What a great way to remember/honor your father! I love the page. Nice job. I am a follower. Wow, what an absolute beautiful layout. Love the flag! I love this layout-that paper pieced flag is very very cool!! I have a photo of my husband's grandfather that would be perfect for this! Your page is just lovely! I am a follower! Love the old photos and your Mom's card. I'm a follower. I am so loving your layout...what a great idea that I really need to copy for some layouts for my husband's military pictures. I just love your flag. This is an awesome page. the colors really offset the b & w photo. I love this idea Mary Ann. This is a wonderful layout! This is a wonderful layout in honor of your dad. I like how you made the flag. Very nice layout. Like the strips used to make the flag shape. What a great layout! Love the way you created the flag! That looks amazing! that's a "hand over your heart" layout! Love the way you did the flag background ! Very creative. I'm already a follower. What a totally cool layout! I can believe you have your mom's card, and the stitched stripes are awesome. :) I'm a fairly recent follower of your blog, but your posts have been inspiring! Thanks for sharing! Love how you distressed the flag stripes to match the worn card. wonderful work, thank you for sharing and the chance to win. I just became a follower of your blog. Your layout honoring your Father is amzaing. Love the flag look and using memorabilia is perfect. Thanks for the chance to win. Love your layout and the look of a flag. Great distressing on it. Amazing page Mary Ann!! Love the Blue and Red on the kraft background and the distressed edges looks really awesome!! Love this layout honoring your father! What a great keepsake to have - your mom's card is a perfect addition. What a touching page and so meaningful for generations to come. Love the flag. Thanks for the inspiration. Also a follower. Already a follower. So inspired by your heritage layouts. I have a huge stack of heritage photos and memorabilia to scrap, and you are firing me up to do it during the cold months to come. 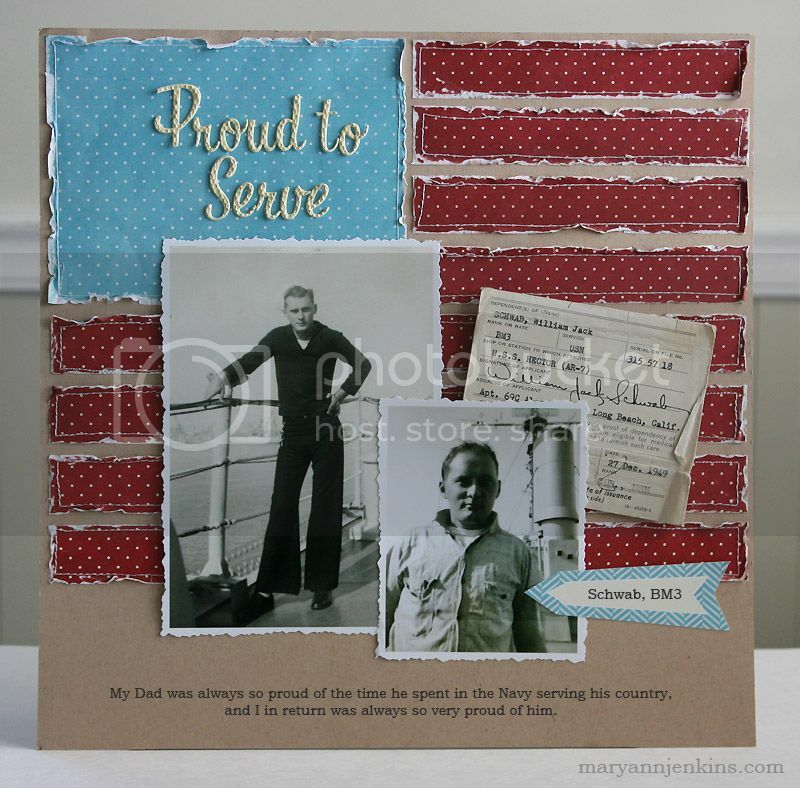 Maryann, this is a gorgeous layout...and what a lovely way to honor your dad's service to our country! I am in love with that layout!!! Great idea on the flag design. I especially love this layout. Both my father and my oldest brother were Navy men. I love your LO - the torn & stitched stripes, the old photos & memento! I became a follower too! Oh my! 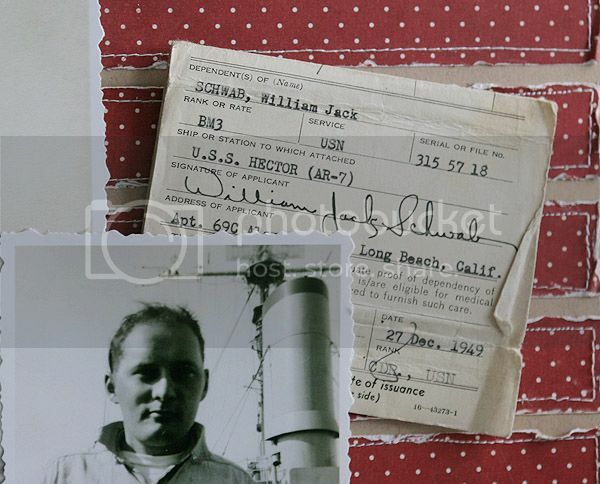 I love the layout of your dad and the memoribilia you included....what an heirloom! I am now your 235th follower. Love how you made that flag! Super creative layout! I was already a follower! This is awesome. Love the way you recreated the flag. All that stitching and distressing. Wow. Great use of memorabilia too. My two new favorite techniques are distressing and stitching and you used them both with fantastic results! My dad was military too but I have to say that's the first time I have seen the dependent card, by my time as a brat we had the IDs. Great layout! I would so use this in my history class. This is such a fabulous layout! What a great way to honor your Mom and Dad! I love that you still have your Mom's card and included it! My hubby is ex-Navy and this is making me want to dedicate a layout to him! What an awesome LO, what a great way to honor your Dad. My father in law was a veteran too, I get kind of emotional on this date. I'm already a follower, thanks for the cance.